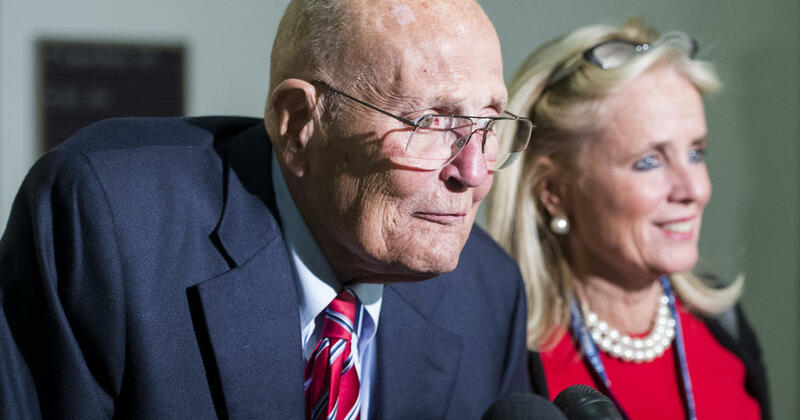 Family and friends are honoring the life of former Rep. John Dingell, the longest-serving member of Congress in history at his Dearborn, Michigan funeral on Tuesday. The 92-year-old, who had a heart attack in September, had entered hospice care last week, a source close to the family confirmed to CBS News. The cause of death has not yet been released. “Dignity was how John walked, dignity was how John talked, dignity was how John carried himself,” said Biden. Biden also remembered the former Congressman’s sharp wit, his biting tongue and brutal honesty. “He knew the difference between a hot mic and a cold mic, that’s for sure,” Biden joked. Following the violence in Charlottesville, Virginia in 2017 spawned by protests by White Supremacists, Biden said Dingell’s response was classic John: “I signed up to fight Nazis 73 years ago and I’ll do it again if I have to.” The anecdote drew large applause from the church pews. While a handful of members attended Tuesday’s service, CBS News’ Rebecca Kaplan reports that the military planes carrying members from Washington to Michigan for the funeral had to turn around due to bad weather in Detroit, according to a House leadership aide. Republican Congressman Billy Long of Missouri tweeted that Rep. John Lewis, D-Georgia, House Speaker Nancy Pelosi and Michigan Rep. Fred Upton “held an impromptu service at 30,000 feet” after being forced to turn around. After the service, Dingell will be transferred to Washington where former President Bill Clinton, House Majority Leader Steny Hoyer and former House Speaker John Boehner would all be speaking at a memorial service at the at the Holy Trinity Catholic Church on Thursday.